3) you take turns with your spouse and one person watches the kids while the other trains and then you switch, but then that prevents a great opportunity for you to train with your spouse. How about a little of all of these? Some days you train before everyone’s up. Some days you get your workout in while kids are doing their activity and best case you train with your partner (partner training is awesome). Some days you take turns with your partner getting your workout in while the other watches the kids. Some days the whole family trains together. Which brings me to…PTO Family Boot Camp. 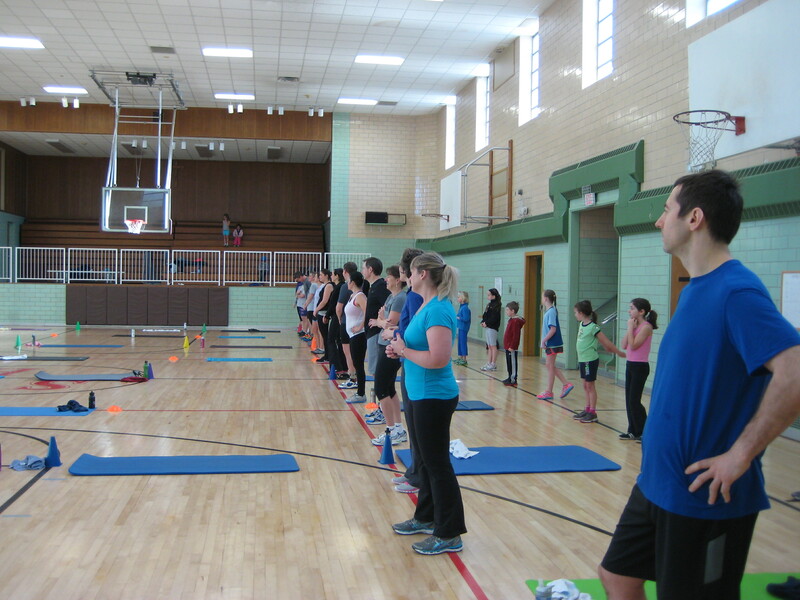 We’re in our 5th year of Change Your Body Boot Camps and after being asked numerous times if I’d ever do an adult – kid workout, and after one Nemo Blizzard canceled our “dress rehearsal” event, we held the PTO Family Boot Camp Workout last weekend and it was a major success. No one got hurt, everyone smiled & laughed, everyone sweat & had fun and everyone got 50min of cardio-core conditioning in (though some parents said it was the easiest 50min of cardio they’d ever done), while the parents got to hang out & train with their kids and other families and the kids were able to associate positive emotions with training and hard work (parents already know this, right?). It had been 10+ years since I coached kids so I had to remember what it was like to work with kids again. What can/can’t they do? How do you talk to them? How do you keep them focused? 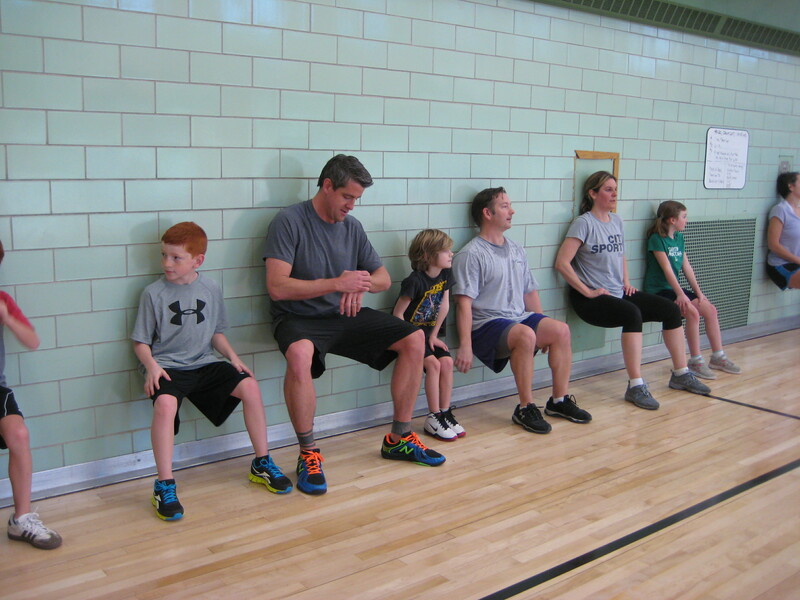 How do you get adults a great & effective workout in while not going to fast for the kids? 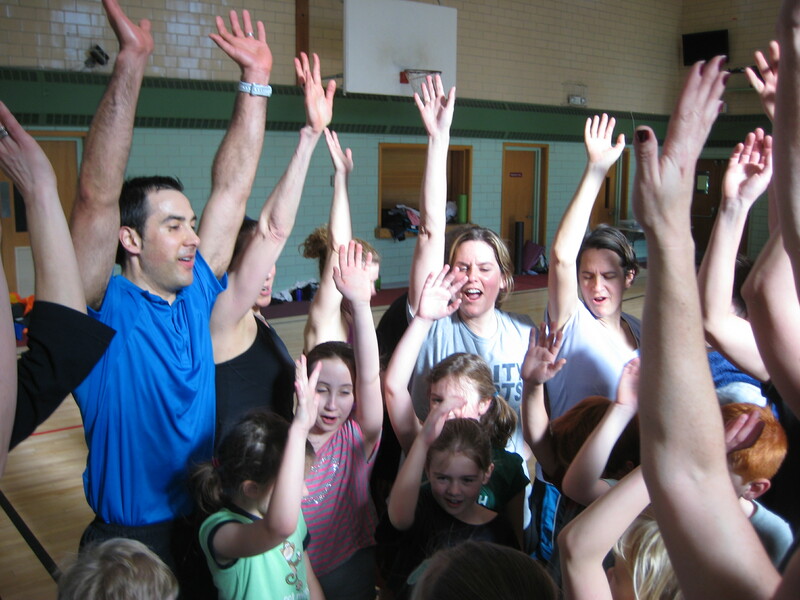 How do you keep the kids “engaged” without boring the adults? Talk about losing sleep the night before preparing for this event. Speak in bullet points (raise your hand if you want to have fun!). Set up rows & columns. Keep the reps short (kids only have so much reserves). 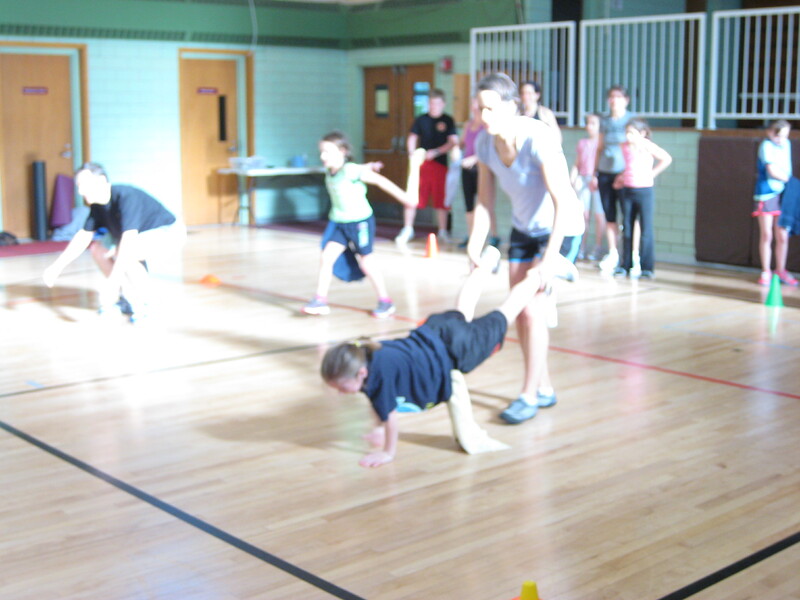 Use lots of dynamic movement (kids love to run around & especially crawl). and add levels for different ability levels. Be flexible to change on the fly. Too easy or too hard? Plan for long water breaks (2min+) as kids need it and you want to reduce injury risk with people you haven’t coached before. Try to make the experience like an adventure (like Disney World does with Pirate stuff). Have a game. 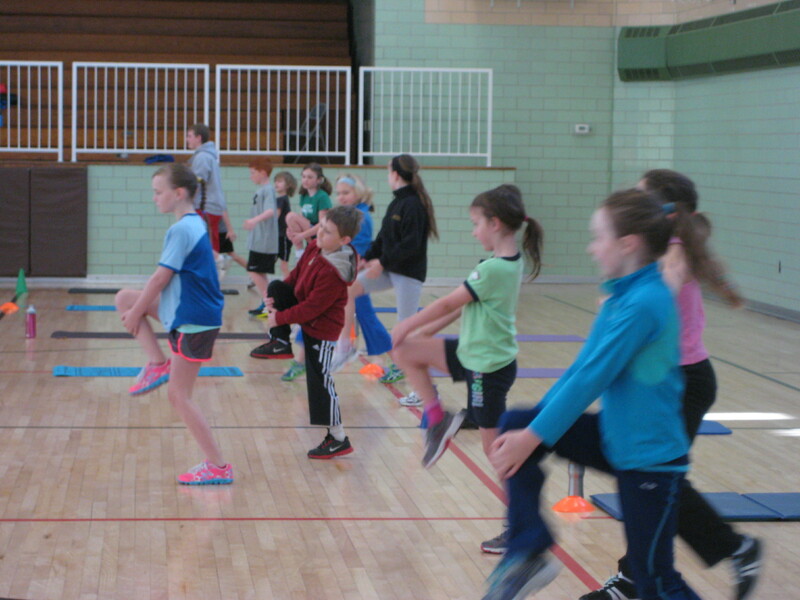 You might even be able to do 50min of “tag”, but the adults would need a more specific warm up b/c they tend to sit more for work in my experience. 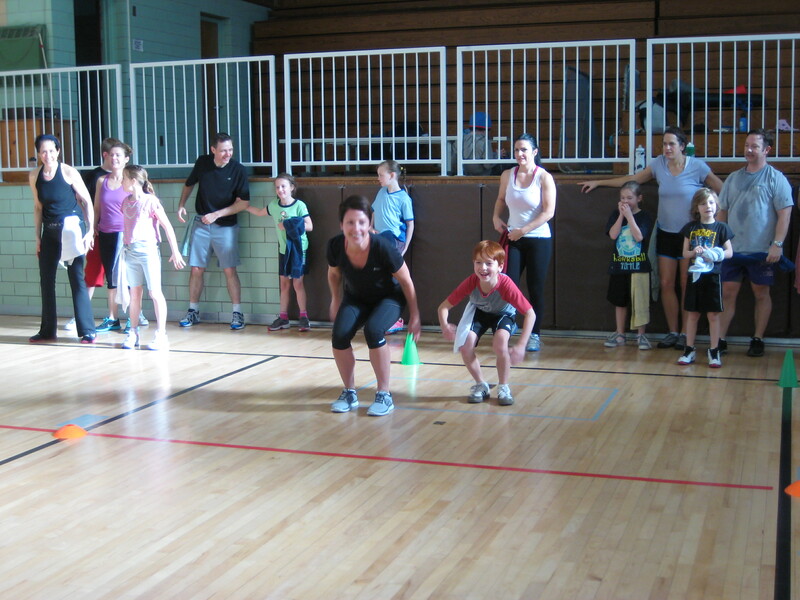 How can you play with your kids and still get your workout in? Do warm ups together moving across 5-10 yards. Keep reps short, 3-5 reps is a good starting point for strength & jumping exercises. Keep planks or stability holds short, 10 seconds is a good aim. Give enough rest b/w circuits 1-3min so everyone can keep form, especially the population you don’t train normally (in my case the kids). 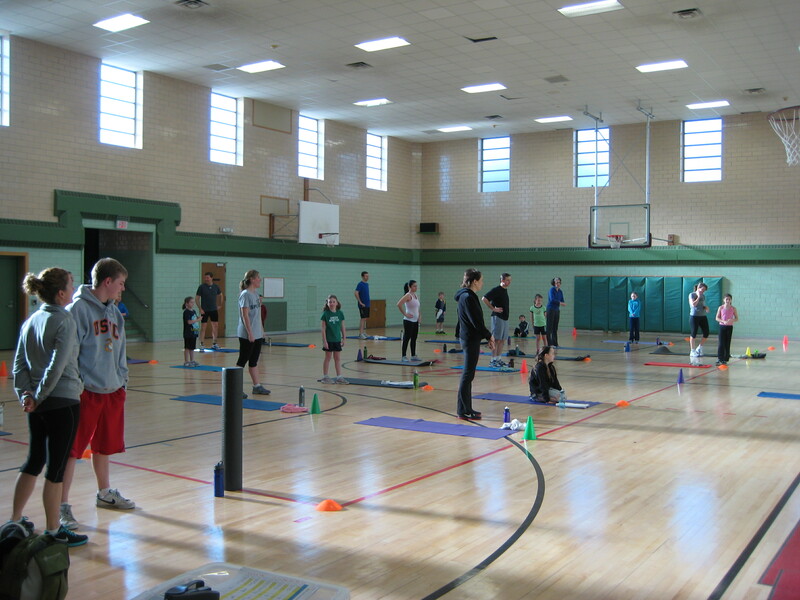 Alternate standing exercises with on the ground exercises. Change traditional exercise names to something fun (e.g. Overhead Squat is “be the Surprise in the Birthday Cake” move). Play relays. Most everyone loves relays. Do obstacle courses. Most everyone loves obstacle courses. Play tag. Kids love tag and many adults too. Use body weight movements & calisthenics. Form is always important. This is an opportunity to teach a life skill. Use animal moves & names. High Five, smile & laugh a lot. Don’t be perfect or try to be. Aim for the long term goal of creating a family tradition of training together. You can do this if its loose & structured, fun, something everyone can do together. Have you ever trained with your family? Above is a video of my family (mom, sister, brother in law, and cousins all training together outside a cottage by the beach). Everyone in the world has to train (exercise). 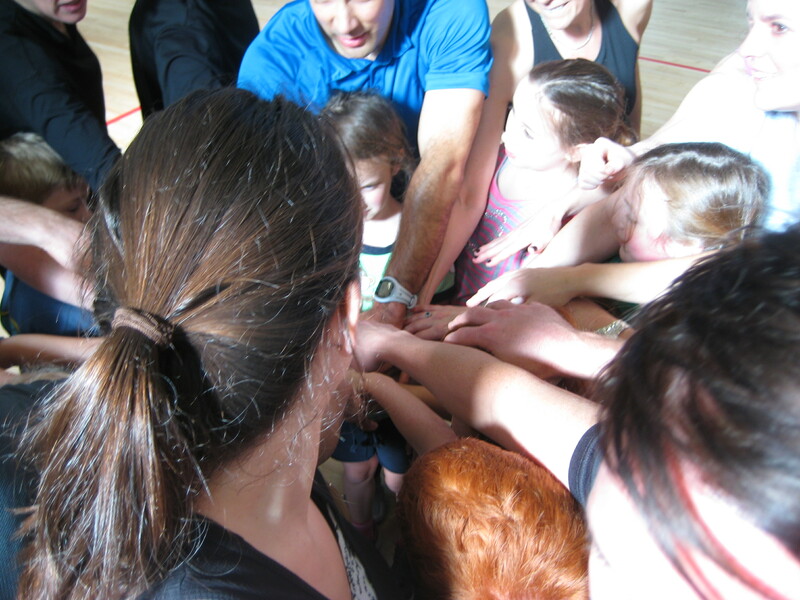 Why not train with your family & friends sometimes so you can enjoy happy hormone highs together, create new stories and empowering change in your relationships, family tree and personal health. Want to get in your best shape? contact me now. The below article is a guest post written by and reprinted here with permission by one of my mentors, Mike Boyle, arguably 1 of the top strength & conditioning coaches in the world, the current Boston Red Sox Strength & Conditioning Consultant, owner of a Men’s Health Top 100 Gyms in America, Mike Boyle Strength & Conditioning in Woburn, MA; former S&C coach the BU Men’s Hockey national champions, former Boston Bruins S&C coach, former Women’s Olympic Gold Medal Ice Hockey S&C coach, current S&C coach to middle school, high school, college, amateur, Olympic and professional athletes; internationally renowned speaker, author, fellow athletic trainer and fellow Springfield College alumni (biased #1 sports science school in the country). I have a favorite quote that is particularly applicable when it comes to training kids. The reality is that you will not always be there to pave the way for your child, fix things, argue with coaches etc. etc. Kids will grow into adults and experience grumpy co-workers and mean bosses. Constantly insulating kids from difficult situations and consistently cleaning up the mess they create defeats the purpose of sport. Sport is about learning to succeed and to fail, not just to succeed. Sports should primarily provide life lessons. If the life lesson learned from sport is that Mom and Dad can and will fix everything, later life will be difficult. If the lesson is that school is something you have to do but sports are what is really important than, be prepared for some really big problems down the road. Youth sports has become all about success and scholarships instead of about learning and sportsmanship. I have some bad news for all the parents out there. Your child more than likely won’t get a scholarship. If he or she does get a scholarship, they probably won’t make the pros. I’m not trying to rain on anyone’s parade, I’m just a realist. I have more bad news. Those parents who consistently prepare the path for the child by confronting teachers and coaches, changing teams, changing leagues and changing schools are making life-long losers out of their children. Remember the purpose of sport is to teach kids about success and about failure. The failure lessons may in fact be more important than the successes. Everyone wants their child to succeed, it’s universal, it’s part of being a parent. However, it is when we attempt to alter the normal path that we screw things up. Protecting your child from difficult situations only delays lessons that are very necessary. Failures experienced at twenty one are far more painful than those experienced at ten or twelve. You don’t do your child a service by protecting them, you do them a disservice. Remember you are a parent. You are not a friend, a manager, or an agent. Your job is to help create a competent, capable adult, not a dysfunctional child. My mother had a wonderful saying on our wall when I was a child. It said “Children learn What they Live”. The same one hangs in my kitchen now. If you consistently prepare the path for the child you postpone the inevitable. The key is value education. Teach your children what is really important. Teach hard work, commitment, loyalty and dedication. The next time you make a decision involving your child’s sport or sports, ask yourself “Am I preparing the child for the path or the path for the child”. This simple step will guide your decision making every time.